If you like potato skins as much as The Baron and I do, especially ones that have cheese and bacon for an indulgent snack, then this is a potato dish for you. I really was hoping for leftovers - this made an 8x8 pan that fed 4 adults & 1 toddler - but I had no such luck. 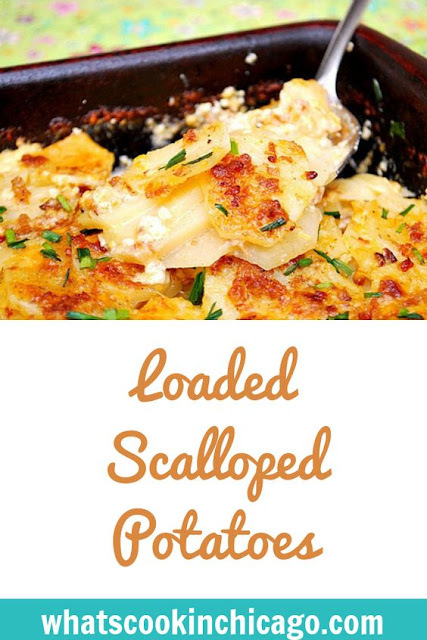 So I would definitely recommend doubling the recipe if you have potato lovers to feed. The recipe is reminiscent to potato skins without the trouble of scooping out potato boats, frying or baking the shells and then topping them with cheese, bacon, sour cream, chives, etc. Even better is that this can easily be assembled ahead of time and then baked the day you plan on serving. In a saucepan, heat up the cream with a sprig of thyme, chopped garlic and nutmeg. 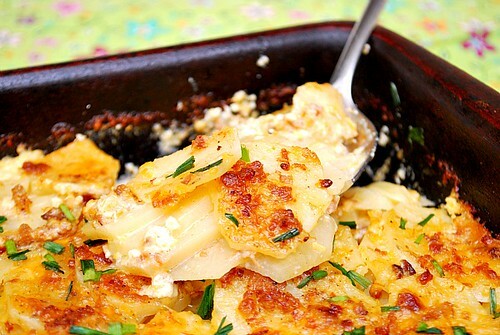 While cream is heating up, butter a casserole dish. Place a layer of potato in an overlapping pattern and season with salt and pepper. Remove cream from heat, Take out sprig of thyme and then pour a little over the potatoes. Top with some grated cheddar cheese. and crumbled bacon. Repeat and make 2 more layers. Bake, uncovered, for 45 minutes in preheated oven. Remove from oven and sprinkle some more cheddar cheese and return to oven to broil until cheese browns, about 5 minutes.